Rinse the rice well in a sieve and then put into a small saucepan with 250ml of water and a pinch of salt, if using. Bring to the boil, then reduce the heat and cover with a lid. Simmer for 25 minutes without lifting off the lid, then turn off the heat and leave to sit for another 10 minutes for perfectly cooked rice (or simply cook according to packet instructions). This rice can sit happily for up to 30 minutes with the lid on. Meanwhile, peel the garlic and use a garlic crusher or grate on the fine side of a box grater. Cut the red chilli in half and remove the seeds with a teaspoon, then finely chop, if using. Cut the pork chops into strips and place in a bowl with the prepared garlic and chilli, if using with the cumin and soy sauce, stirring to combine. Set aside at room temperature to allow the flavours to develop. Using a small sharp knife, cut the onion in half and peel off the skin, then put each half on a chopping board and cut into thin slices, then cut off and discard the root intact. Peel and cut the carrots into thin slices. Trim the scallions and thinly slice on the diagonal. Heat a wok or large frying pan over a medium heat. Add the oil to the heated wok and sauté the onion and carrots for 2-3 minutes until just beginning to pick up a bit of colour, stirring occasionally with a wooden spoon. Add the scallions and stir-fry for another minute. Tip in the marinated pork and stir-fry for 3-4 minutes until the pork is cooked through and tender and the carrots still have a little crunch left. Season with pepper. 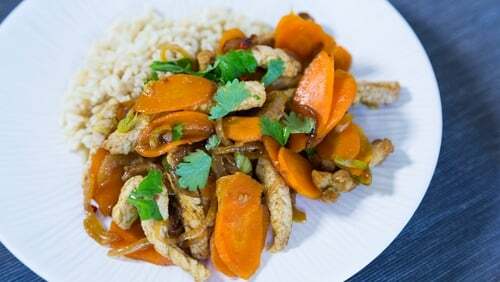 Fluff up the rice and divide amongst bowls and spoon the pork & carrot stir-fry on top. Scatter over the coriander before serving. Marinate the pork and keep in a bowl covered with clingfilm for up to 3 days in the fridge. Have the vegetables prepared and stored covered in clingfilm ready to cook and the rice could be cooked up to 3 days in advance and kept in the fridge in an airtight container.